Today I celebrate thirty eight years with the love of my life and heart, Michael Daniel Butka. This post concentrates our first year together. 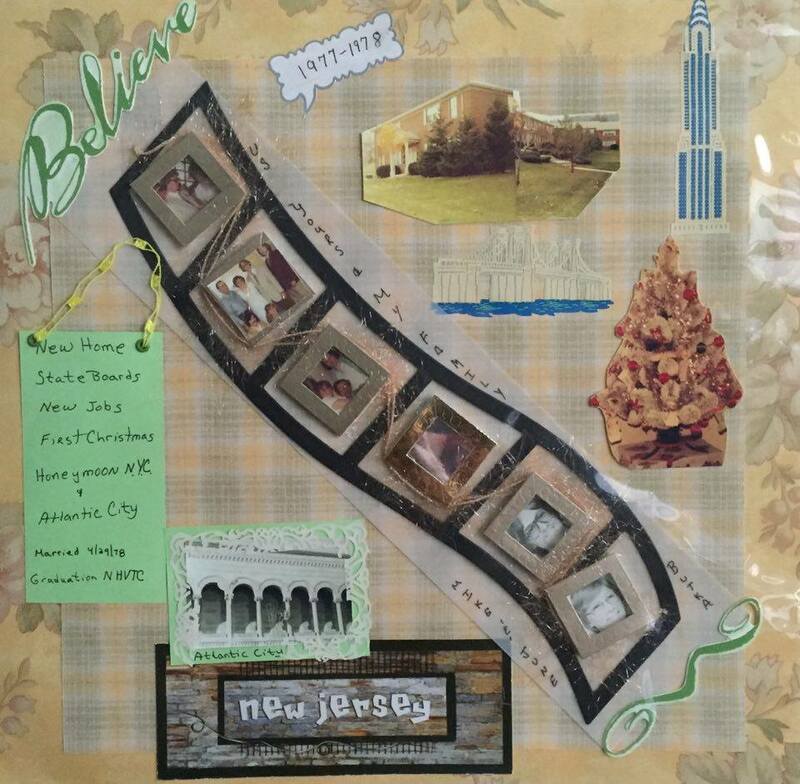 This is a page from the scrapbook I created for my husband to celebrate our first twenty five years together. This one page is power packed with memories. It tells the story in pictures of our first year together. I blogged previously about how we met. Our first Christmas Tree purchased on the way home after spending our first Thanksgiving together with his family in Milford, Connecticut. Michael’s family- father, Daniel Zigmund Butka (1928-1987); June Stearns Butka, Michael Daniel Butka; brother, Stephen Paul Butka (1958-2001,) sitting brother-in-law, Daniel DellaGioia and sister, Danielle Marie Butka DellaGioa. Michael’s mother, Loretta Dula Butka was unable to attend. She was caring for her ill mother, Francis Kotch Dula (1909-1986.) Photo taken by my father, Nelson William Stearns (1930-1988.) Photo taken at Sagamore Court Portsmouth, New Hampshire. My family- June Stearns Butka, Nelson William Stearns (1930-1988) and Shirley Beatrice Pease Stearns (1935-2001.) Photo taken by my husband, Michael Daniel Butka on our wedding day at our Sagamore Court apartment. Blank film strip was in the middle separating our wedding photos from our graduation photos from college. Michael Daniel Butka graduation photo from New Hampshire Vocational College Technical School Drafting Program. June Stearns Butka graduation program from New Hampshire Vocational College Technical School Practical Nursing Program. The bottom photo is Atlantic City, where I took my Nursing State Board Exam. Our first year together was a roller coaster of life events, adjustment, lows and highs that provided a strong base, as a couple, for the years to come. Our love, respect, communication and support of each other in the good and bad times has never faulted. I dedicated this post to the love of my life and heart, Michael Daniel Butka. Happy 38th Anniversary, Mike. I look forward to each and every day we have together. May there be many more years to share.